One of my favorite books I read in 2018 was Clare Mackintosh's I Let You Go. It had a killer twist, and as I said in my review, "is a powerful tale of grief, guilt, and unimaginable horror." In I See You, Mackintosh continues that unbearable suspense she is known for, and while I didn't enjoy it as much as her masterpiece, it was still a worthwhile read. Each day, Zoe Walker takes the exact same way to her train, waits for it in the exact same spot, and sits in the exact same seat. She comes across her picture in a newspaper advert for a dating site, but she has no idea how it got there. A new woman is shown in those adverts every day, and dangerous things begin to happen to them all. The police frantically work to solve these crimes and find out who is responsible before something happens to more women, including Zoe. 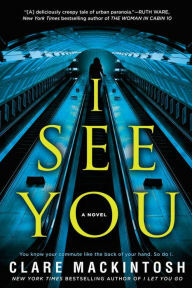 I See You doesn't let up on the dread, claustrophobia, and paranoia. Mackintosh is skilled at ensuring that each line she writes means something; there are no throwaway lines so readers better pay attention. I was able to figure out the main culprit pretty easily, but I definitely didn't have a clue about the shocking epilogue. All in all, I liked this one better than a lot of psychological thrillers I've read lately.